The Friday after Thanksgiving has always been a day I like to spend outdoors whether fishing, hunting, or just going for a walk. This year, Mary May was stuck at work all day and the weather looked fantastic, so I decided to head to a small, local river. I have actually only fished this particular part of the river twice before. One of those times was in mid-February and I only managed a handful of small bass. The other time was early this summer. The bite was a little slow then too, but I did manage a 4 lb bass on a buzzbait. So, I really wasn't sure what to expect. I was joined by Gary "froggy waters" Ribet, who also wanted to scout the stretch a bit more, as he had heard mixed reviews. He also wanted to show off his new bait tank, which he has been designing. We launched and slowly pushed up-river. Gary had 7 or 8 rods out trying for crappie (or anything else willing to eat a minnow) and I tied on a plastic worm to fish for bass. On my second cast, I landed a 12" bass and ten minutes later landed another short, but chunky largemouth. We both thought for sure that we had a great day ahead of us. But, then the bite got slow....VERY slow. Gary couldn't get anything to eat his minnows and it seemed like my plastic worm was invisible. Finally, we decided to turn around and fish back down river. On the way, we ran into a local fisherman who told us the best fishing is usually above where we had turned around. We looked at each other, a little frustrated that we hadn't fished further, but we weren't turning around at that point. After all, we had barely managed a bite in quite some time. But then, suddenly, our luck started to change. I picked up a 2 lb bass, then another. As the wind started to pick-up, I threw my worm along a downed tree and wham - a big fish nailed it and started running like crazy. He tried to head for the cover of the log, but I managed to get him out into open water. My Coosa spun back 180 degrees and my drag was ripping. Finally, the brute surfaced and I grabbed him - a solid 5 lb bass. We rounded the next corner and were at the launch area. Suddenly, I look over and see 3 of Gary's rods get bit at once. While watching him, I hooked another bass. Then I see 3 more of Gary's rods start bobbing from bites. After all of that time, Gary had found his honey hole....right next to the launch. I fished through the area a little more and managed another 8 bass up to 3 lbs. Gary was busy catching fish after fish after fish, often hooking 5 or 6 at a time. I think the wind, which picked up in the late morning, was the key to getting the fish more active. This is often the case, whether on a river, lake, pond, or anywhere else. Eventually, I joined in the crappie fishing action and for the next few hours we caught fish as fast as we could reel them in. By the time we got off the water, I would estimate we caught 70 crappie and a few more bass. One of many nice crappie caught with Gary's super rig! It was a fantastic day of scouting some new, local water filled with quantity and quality. Small flows rarely suprise me anymore, as I have caught a pile of big fish from small rivers this year, but I must admit I was a little suprised at how well we did on that stretch. Hopefully I can manage another river trip or two before winter sets in. Until next time, tight lines! After our last outing on Belews, Bill Kohls and I were interested in testing our talents against some competition. Last weekend was the bi-weekly open tournament on the lake that draws a mix of local and regional anglers. A few of them, as we came to find out, fish the BFL and FLW tours and carry some impressive sponsors. The assortment of bass boats was impressive as well, but Bill and I knew we had a good game plan and at 7 AM we running across the lake to our first spot. We hooked two fish within the first 15 minutes, both short, but quickly hooked two more that kept. These fish were all caught on drop shots and plastics in a creek arm with a deep channel. Then I caught a solid 3 lber on a Spro Little John DD crankbait and Bill followed with a fat 2.75 lb fish on a Strike King 6XD. It was 8:30 AM - we were one fish from a limit and catching small fish with regularity. We just wanted to get one more before we upsized our baits and chased some culling bass. We ran to our next area and I bombed a cast between two docks. My line went tight and I set the hook on a nice fish. She ran hard sideways and I fought hard to get her into open water. But, my fear became a reality. Somehow, I got her around the posts of the dock, but the line hung up on the motor of the adjacent boat. A few seconds later, she was gone and my stomach dropped. I never got a good look, but I estimate she went between 3.5-4.5 lbs judging by the fight. The fish would have been a very key part of our day. We then went a long time without many bites and the bites we had were short fish. We did see a couple big fish follow the small fish to the boat as we reeled them in, but we couldn't get them to bite. We also knew the bite was changing. That deep cranking bite we had been on a couple of weeks ago was completely gone and many of the fish were very deep. Unfortunately, our electronics did not allow for us to move deep and fish spoons and drop shots for those fish. So, we focused on fishing areas that fish use to move from shallow to deep water as well as shoreline cover. It was around 1:30 PM and we needed a 5th keeper badly. I tossed my plastic worm near a laydown and twitched it a few times with no luck. As I started to reel the bait in, I looked down and saw a 4+ lb bass swim away from the bait. My heart sank, as I knew my tournament nerves got the best of me. Had I properly dead sticked the bait and fished a little slower, I am almost positive that fish would have hit. Instead, I spooked him and he was gone. This is a big part of tournament fishing that most people never realize. Controlling your adrenaline, emotions, and body are a huge part of tourney day. At this point I felt pretty down...and our next stop didn't help. I caught a short fish off a dock before losing another short. Finally, Bill got a good bite on his dropshot, set the hook, and watched a 3 lber go airborn 8 feet from the boat. Unfortunately, we also saw the dropshot rig fly sideways into the water...fish off! It was 2:15 PM and we had 45 minutes before weigh-in. We had one more area we wanted to hit, but decided to stop at a staging area with docks on the way. On about our 6th dock I threw my worm under a jet-ski platform. All of a sudden I felt a bite, set the hook, and a big fish went airborn. My heartbeat sky rocketed as the fish jumped a second time. He had a massive head and was putting the heat on my spinning gear. After a nice fight, Bill got him in the net and our limit was full. The fish was extremely skinny, but measured 22". It would have been a great kayak tournament fish, but we were elated that our limit was finished. We fished the remaining twenty minutes without a bite and headed to the weigh-in. Usually tournaments on Belews take anywhere from 12 to 16 lbs to win, as the lake isn't known for big fish, but has a lot of solid fish. Our final bag weighed 12 lbs 5 ozs and our big fish was 4 lbs 15 oz. That was good enough for third place and a tie for big fish. The winning bag was a tad over 15 lbs. We also learned that we were the only boat in the field fishing shallow and most spent their day in 50-100 feet fishing spoons. We knew if we had landed my fish in the morning and Bills drop shot fish late, we would have had the winning weight. Add to it the fish that I spooked by fishing too fast, we would have put together a monster limit for that lake. However, we were extremely happy to have done well in a talented field while doing something that wasn't working for anyone else. It was another one of those "never give up" days where we managed a big fish late. The day illustrated the good and bad, ups and downs, & victory and defeat that accompany tournament bass fishing. Those highs are what keep me coming back and push me to learn more and more about the sport. A huge thanks to Bill for inviting me to team up with him and letting me clutter up his boat! Now, it's time to drag the yaks out and go for a post Thanksgiving paddle! Until next time, tight lines! 4-4.5 lber from one of my favorite flows! She is starting to get deadly with a plastic worm! Her first case of raw thumb....hopefully many more to come! A couple awesome things have happened off the water as well. First, is that I was contacted by Paul Lebowitz, the editor at Kayak Angler Magazine, to write part of a story about spring bass fishing in the southeast. It took me completely by suprise and was a real honor, since KAM is probably the biggest kayak fishing publication out there. I will collaborating with a number of other top kayak bass fishermen including Drew Gregory and Jason Stutts. The article comes out in the spring, so keep an eye out for my contribution and hopefully a photo! Second, Mary May and I are getting a puppy! 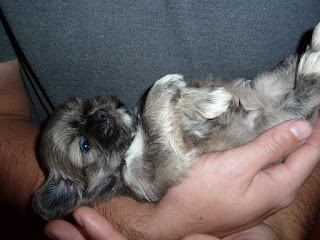 Yep, we are taking that plunge and welcoming a cute little shih-tzu into our home. We are naming him Huckleberry....Huck for short. Some of you probably know that I have a 7 year old dog, Brewer, who is a golden retriever-chow mix. So you can imagine, I wasn't sold at first on the idea of a small dog. But the shih-tzu breed really grew on me and I can't wait to bring him home. We get to pick him up during the first week of December! This weekend I will be joining Bill Kohls to fish a bass boat tournament. It should be an absolute blast, as fishing with Bill usually is. I can't believe crappie season is just around the corner, so I hope everyone is landing bass while they still can. Tight lines! This past Saturday I found myself in an unusual position. The heavy Thursday and Friday rains were much needed, but they had turned the local rivers to chocolate milk. And since it was supposed to be very windy, I decided the Coosas were getting the week off. I was up early and headed west to meet good friend Bill Kohls and do some fishing on Belews Lake, NC. I didn't know anything about Belews prior. In fact, I didn't even look at the lake on Google Maps, which is an extreme rarity for me. Instead I relied on Bill's knowledge of Belews. The big things to know are that it is a very clear lake, it is a fairly deep lake, it is power plant lake (ie - warm water), and that it has docks. I was literally salivating at the idea of fishing Belews. I rarely fish water in North Carolina where I can see the bottom in 10 feet. Plus, the air temp started out at a brisk 35 degrees and was only predicted to rise to 50, so warm water was going to be a huge perk. After getting our gear situated, we launched the boat and were on our way to explore the hot hole area. Duke Power doesn't let you get close to the actual hot hole, but you can get to an area with visible current and water that was reaching 85+ degrees. We quickly realized that the warm water was not the ticket and moved across the lake. I quickly lost a short fish on a Lucky Craft CB250 crankbait and a few casts later had another small bass chase my worm to the boat before retreating to the depths. We weren't seeing shad, which bothered us, so we moved again. The new spot looked good, with a mix of rip-rap and docks. Before long, Bill boated the first bass, which blasted his topwater bait 3 times before completely inhaling it. On the next cast I lost a bass on a plastic worm and lost another not long after on the same worm. I was a little frustrated because usually I have a good hook-up ratio on shakey head worms, but so far I was 0 for 2 on the worm and 0 for 3 overall. We moved to a wind blown bank and that is when we started figuring out the pattern. The fish were on deep, tapering, wind blown points in 13-25 feet of water. We pulled out our deep running crankbaits and went to work. The Spro Little John DD proved to be the best producer in large part because it was getting down to the bottom in 20 feet of water. "Clear Charteuse" and "Spooky Nasty" were the best colors on the day (and also two of my general favorites) and our Carolina Custom Rods cranking rods made throwing those cranks an absolute joy. In particular, my CCR deep cranking rod is an absolute beast paired with a Shimano Curado 200 DPV with a 5.2:1 gear ratio. By noon we had about 14 lbs in the boat (our 5 fish limit) and had culled quite a few fish. Although most of our fish came on deep cranks, our biggest came on a plastic worm. We were already pretty satisified with our day and decided to go try for catfish for a while. Long story short, catfishing was slow and we only managed a few small bites. After that we messed around a little in an area of the lake Bill hadn't fished before, but only managed a couple small bass. And before we knew it, it was time to snap a few photos and head home. Bill and I were happy with our day on the lake, particularly because 14 lbs is a good limit from Belews and we left them biting. I actually think we could have culled up to 15-18 lbs had we kept bass fishing and got a little lucky. It was odd fishing late summer patterns in cold, fall weather, but it is important to recognize that water temperature will dictate where the fish will be. When bass set-up on those deep points eating shad, you can usually catch fish on deep running cranks (like we did), flutter spoons, or even Carolina rigs. This week it will be back to the yak to search for some chilly river bass. Until next time - tight lines! Over the past few months I have been searching for a stern light for my kayak. One of the most popular is produced by YakAttack and is called the Visipole. YakAttack was a small company that started in founder Luther Cifers' garage, so supporting the small business definitely appealed to me. However, I kept putting off buying one. As I searched for sponsors for the Froggy Waters Freshwater Slam, I stumbled onto the Kayalu website. Kayaklu is another small company based out of Cambridge, MA and made entirely in the US. They offer a wide variety of kayak fishing products, including an 18" light called the Kayalite. My initial reaction was that it looked gimmicky...but then I started to look a little closer. The concept was simple. You attach the bottom of the Kayalite to an eyelet or deck loop via a clip attached to a bungee. You then pull the bungee tight and tie it off around the cleat on the light's mast. That was it - you were set and the light was safe and secure. My next thought was - OK, so the light attaches easily and is a great idea, but at 18" is it high enough? Well, a quick trip to their website and the US Coast Guard site revealed otherwise. After a number of tests, 18" was determined to be the ideal height to be seen - even in high wave conditions. The beauty of it, is that it is also short enough that I don't have to worry about hooking it on a backcast. After exchanging a series of emails with company headman Steve Hollinger, I had a Kayalite in the mail. When it arrived, the simplicity of the design really hit me and I was excited to get a chance to use it. The "installation" was a cinch! First, I drilled a hole in the back hatch of my Coosa. The Kayalite came with a drill bit of the correct size, eyebolt, and nut - so everything I needed was already provided. I then inserted the eyeblot into the hole and tightened the nut on the opposite side of the hatch. I clipped on the Kayalite and tightened it down. Now I was ready to role! The Coosa looks sharp with the Kayalite on the back! Because of work and weather, it took me longer than desired to do some on the water testing. When I finally did get out, I was nothing but impressed. The first thing I noticed was that Kayalite had a little give. If it hit a branch, it simply flexed around it and returned to the upright position. That is something neither suction cup or rigid pole designs can do. As a river fisherman, that was a HUGE perk. I also noticed how incredibly bright it was, yet I didn't feel like it hindered my night vision at all. I definitely feel better about having one of these lights on my kayak rather than a basic head lamp. A huge thanks to Steve and Kayalu for hooking me up! 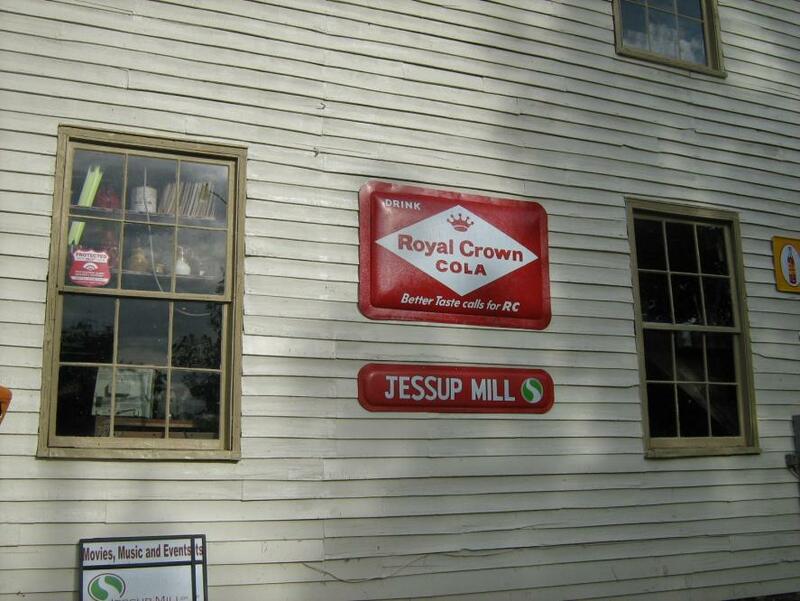 Manufacture and Assembly Made in the U.S.A. The Kayalite is incredibly affordable at $39.95. I strongly recommend you check these out. If you do a lot of fishing on rivers or small bodies of water these are the perfect light. They also work for ocean kayaking and big water adventures. Plus, with new laws in may states requiring a light on board at all times, these fit the bill perfectly. As the crowd gathered into the pre-tournament meeting, a sense of excitement grew. Prizes lined the room, including the camo Coosa featured as the grand prize. The premise was simple - the biggest 3 fish limit of 1 bass, 1 catfish, and 1 panfish would win as long as they were caught in a river, stream, or creek within roughly 40 miles of the meeting location in Bahama, NC. And as participants, youth and adults alike, exited the meeting - I knew it was going to be a great event. Gary Ribet and I had been planning the event for quite some time and had worked extremely hard to secure prize donations, sponsors, and donations for the Schoolhouse of Wonder - our ever deserving charity. Wendy Tonker, one of the admins at Schoolhouse of Wonder, was also instrumental in our success and deserves a huge thanks. Mary May and I spent the majority of our Saturday on the water with Zach and Julie - a brother-sister pair hoping to do well. Zach is a teen who loves to fish and his big sister agreed to fish with him for the day. Mary May and I were hoping to help them catch a few fish and have fun. It turns out, they didn't need much help from us. They caught a crappie as soon as we met them and went on to catch bream throughout the day. And Zach gave it his best shot, throwing nearly every bait he had, but couldn't come up with a bass or catfish to complete the slam. Although tired from fighting the wind, they had a good time on the water and met us later at the weigh-in. I returned to the weigh-in location with Mary May and started prepping for the festivities. The BBQ chicken grilling outside smelled incredible and all sorts of reports were coming in. Anglers fished many different rivers in the radius. Some were muddy and others gin clear. Some were extremely shallow and others flowing at near perfect early fall levels. And some were near the outside of the radius, while others were a mere minutes away. The room was near capacity as many of the participants had returned with friends and family - giving it the feel of a true community event. Photos were judged by Gary and two of the executive board members from Schoolhouse of Wonder and then passed to me and I put them into a short presentation. In 5th place was the father-son team of Brandon and Tyler Olson. 4th place went to Wendy Tonker and her youth partner Diante - who found their fishing spot much lower than expected. 3rd place went to local Travis Olson who put together a nice slam. 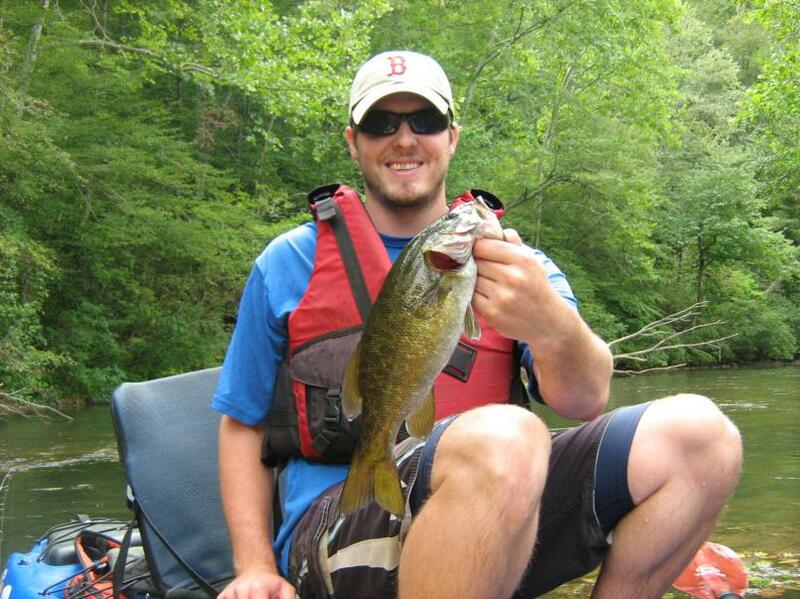 2nd place was earned by Kyle Brafford who was new to most of the rivers of the area. However, he made a smart mid-day change to his strategy that paid off big time. The grand prize winner was Bill Kohls. Bill had a plan of attack on a local flow that required some serious work. For him, the legwork paid off. He caught a 21" bass early and a 22.5" catfish late to help secure the victory. The biggest bass and biggest catfish prizes went to Bill Kohls and the biggest panfish went to John Hoke with an impressive 12" yellow perch. He also mentioned losing a 14.5" Roanoke bass that flopped off of his board before he could snap a picture. The biggest fish (any species) and smallest fish (any species) (courtesy of Settles Bridge Supply House) both went to Bill Kohls as well for his big catfish and 3.5" bream. Additional prizes were then raffled off and literally every single person in the room walked away with something, the silent auction concluded with a ton of awesome items going to good homes, and Wendy Tonker took the floor for Schoolhouse. Not only did she announce that they had picked up new volunteers from the event, but we learned that the Froggy Waters Slam had raised $1500 for Schoolhouse of Wonder. We were so extremely happy and proud to have raised the money for such a great cause. A huge thanks to all of our sponsors and donors, the participants, Schoolhouse of Wonder, Gary Ribet & Froggy Waters Outdoors, Brett Hinson & Carolina Custom Rods, Jackson Kayak, and many more! A special thanks to Mary May Pratt, who put up with me through my late night emails, random phone calls, and weekend meetings as well as tolerating the huge pile of prizes that stacked up in our dining room. I couldn't have done it without your help and support. We hope to make the slam an annual event that grows more and more each year. If you want to make a last minute donation to the Schoolhouse of Wonder, you can do so at their website. Now it is time to relax a little and get back to fishing. We looked at each other, back to the water, then again to each other. This is where we were going to be fishing? This stream, which drains a large section of city before entering a local lake, was inches deep. The sandy bottom did not look conducive to fishing, and I was stuck wondering whether or not we were making a mistake. Worried that it was going to be a day of pushing rather than paddling and dragging rather than floating, we proceeded to launch and meander down the creek. It wasn't long before we were doing just what we had feared - dragging, pushing, pulling, and working very hard with no results. But, around every corner it got a little deeper and a little more tempting. Before long, we were floating, fishing, and happy we had decided to stick it out. So, before you write off that small, neighborhood creek - check this out! The best lures for the day were the Yamamoto Senko and Deep Creek Lures Sink & Catch worm - both 5". Fish were also caught on a Buggs Fishing jig and Assassinator spinnerbaits. Until next time, tight lines! Ok, first thing is first, I have been a blog slacker. It's not that I haven't been busy with the usual fishy stuff, I've just been up to my ears in other things as well. Plus, the video blog I am going to publish later today has taken a while to edit while I learn my way around a Mac. However, keep an eye out, the reports will be coming fast and furious over the next week - including the Froggy Waters Outdoors Slam recap. Not long after I started blogging, I stumbled onto a site called the Outdoor Blogger Network. The folks there run a site that acts as an uber directory for anyone who blogs about the outdoors. The blogs you can find there range from fishing to hunting to cooking to nature to just about anything tied to the outdoors. This week, they hit their 1 year anniversary - an awesome moment for the rapidly growing site. All outdoor blogs are encouraged to join as long as they meet certain (very basic) requirements. The perks from OBN run deep including weekly free gear giveaways, promotion of blogger events, forums, and all sorts of contests. It has been an awesome resource for me as an outdoor writer and helped me connect with tons of other bloggers and outdoor enthusiasts around the world. I owe them a lot of thanks for everything they do....happy birthday/anniversary/1 year success! Check them out! Well, this has been a fantastic week. Work is going great, I joined forces with HOOK1, the Froggy Waters tourney is coming together, and I found out this morning that my article came out in print today in NC Sportsman Magazine. The article is about called 'Spot On' and focuses on the growing population of big spotted bass in the Cape Fear River as well as how I target big spots, the baits I use, and how I approach river fishing. I was really excited when Dan Kibler, the editor, accepted the story and I appreciate him helping me through the process. Hopefully it's not the last article of mine that appears in the magazine! The article is not online yet and I am not sure if or when it will be. However, you can get a rundown of the magazine here. It has rained all day, which I guess makes it a good day for sitting in meetings and in front of a computer. However, the 3" of projected rain also put a bit of a wrench in my weekend fishing plans. Maybe it will be a catfish kind of weekend? Check back early next week for our fishing report (hopefully with video) as well as a product reviews for Buggs Fishing Lures and my new Kayalu Kayalite! Tight lines! I got some great news last week when Chad Hoover extended an offer to join the HOOK1 Kayak Fishing Blog Team. 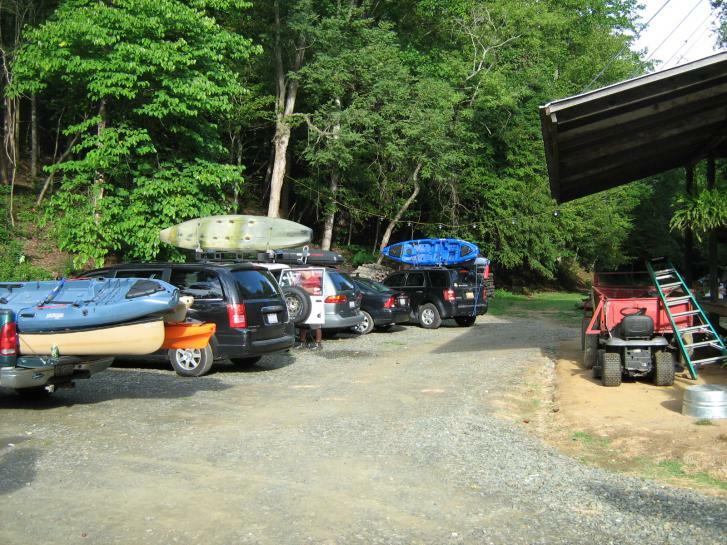 HOOK1 is one of the most reputable businesses in the industry for buying kayaks, kayak supplies, and fishing gear. I am really excited to get the opportunity to blog for HOOK1 and join a talented group of writers and anglers - many of whom I have looked up to since I began participating in the sport. Whether you fish fresh- or saltwater, you will definitely find something interesting on the HOOK1 blog. And if you are a kayak gear junky you will really love the weekly reviews. I am so incredibly amped! My first article, announcing the Froggy Waters Freshwater Slam, came out today. You can find it here. I hope to get an article out each week on that blog. Some of the articles may mimic content on my own blog, but others will be unique to HOOK1. In fact, if you have a cool blog idea, want me to review a product, or want to join me in a fishing adventure, shoot me an email at drew@froggywatersoutdoors.com! You can scope out the HOOK1 blog at www.kayakfishingblog.com and you can check out HOOK1 at www.kayakfishinggear.com. Tight lines! It all came down to this, so to speak, as the RiverBassin Tournament Trail wrapped up in Roanoke, Virginia. Bill and I were sitting in first place for 'Team of the Year' and I was in second place in the 'Angler of the Year' race. The TOY competition was handled like previous tournaments - where you were assigned points based on your finish from the event only. The AOY competition was based on your results over the course of the series as well as your results for the day. I knew being in second place in the AOY race had me in good shape, but there are so many talented guys who fish the trail that I knew I would have to bring my A-game. The day before, Mary May and I loaded up the Escape and headed for Virginia. I wanted to take a look at a few different rivers, because only a few days before most flows looked like chocolate milk and were running at unsafe levels. However, they were dropping nicely and some rivers looked pretty good. With a little help (special thanks to Appalachian Bronzeback), we settled on a tributary to the James River. Mary May and I met up with Bill and his girlfriend Misty at the pre-tournament meeting. The Roanoke Rec. Center was a great location and all sorts of folks were there. As usual, Drew Gregory headed up the meeting. Chad Hoover, the head honcho for KayakBassFishing.com, HOOK1, Wilderness Systems, etc., was there to talk and hand out goodies. Coincidentally, I got my card pulled in the very first door prize raffle and was hoping that it didn't use up all my luck for fishing the next day. The crowd was a mix of locals, regional anglers, and the usual suspects. After the meeting the 4 of us headed to get some food and check-in at our hotel, which was about an hour away. It wasn't the fanciest place (in fact I am sure Mary May and Misty had a few very different adjectives), but it did the trick for the night. Bill and I went through the usual routine - check our lines, sharpen hooks, tie on new baits, and prep gear for the next day. Then we hit the sack. I probably got 2 hours of total sleep, which is about average for me the night before tournaments. It didn't take long before we were headed for the river. We got to our launch spot, loaded the yaks, and were on our way. These start of the day pictures always look darker than it really is. We started with topwater baits and both landed fish within the first 10 minutes of the day. However, they were both small and we were immediately worried about the quality of fish in this river. After landing a few more small fish in the first major rapid, I had a nicer fish (13"-14") swing and miss a Lucky Craft Gunfish. We started working downstream through an area I would rather have fished in the afternoon, but since we were doing a 5 mile float, we didn't have much of a choice. Small fish were abundant to say the least. Finally we came upon an eddy that looked unbelievable. But even there, we could only manage a couple short fish and one 12.5" smallie. This hole also stole my sunglasses, which was not the way I wanted to start the day. We kept fishing through water that looked productive and indeed it was loaded with fish under 11". I just kept thinking that with the cooler temperatures it was a better afternoon spot, but that thought also gave me hope that the bite would pick up as the day went on. But, my luck was not changing. I had a 13" smallie come unbuttoned just as I lifted him from the water and another over 12" flop out of my hand and get lodged head first in one of my scupper holes. As I tried to grab his tail he got startled and squirmed his way through the hole and back into the river. At this point I was in partial disbelief and was just hoping I could catch a break. We were getting tired of catching fish this size. We floated a long way, admiring some gorgeous scenery and fishing some nice looking areas. However, we just couldn't buy a bite from bigger fish. Finally, we kind of started to put together the pattern. The better fish were in the channel. They weren't in the usual holes such as eddies, rock ledges, downed logs, etc. These fished were camped out in the channel chowing. However, this made them tough to target, because they were spread out and not pegged to visible structure. Finally, I threw my plastic worm toward a stump in the middle of the river. I worked it off the stump and then just let it sit for about 20 seconds. As I moved it, a big smallie inhaled it and it was game on! The fish fought like crazy - jumping, spinning my kayak, and just generally putting up a battle. Finally, the 17.25" brute came to hand and my Gamakatsu worm hook was squarely lodged in his mouth. It was a nice upgrade - now I just needed two more! Finally - a big gal decided to bite! We worked the lower stretches of the river and its confluence with the James, but still couldn't manage any larger fish. So, we decided to roll the dice and try to find a spot or two on the James to fish. We found an area with very difficult access, but made our way down the bank. As we saw the water, we immediately looked at each other in disbelief. It was a spot where a tournament could have been won. In fact, it was a spot that might have produced a few really big fish, but it was impossible to fish thoroughly without the yaks, which we had left behind. On my first cast I threw my Spro Little John MD crankbait in an eddy along some rocks. I saw the line get hung up on one of the hooks and was about ready to retrieve it when suddenly, a big smallie jetted from the depths and swiped at the bait. But the fish never actually hit it and immediately went back down. I reeled in the bait, fixed the line, and threw it back out. Two cranks later I felt a bite and was initially very exicted, but after a few more cranks I realized the fish was not the big smallie. However, the 12" fish would help my limit. I landed one more small fish in this spot before we decided to call it a day. I think both of us felt a little regret that we hadn't fished that area initially, but there is always next year! I had 40.5" of bass with my biggest being 17.25". As a team, Bill and I had 54.5". We knew we would need some serious luck to finish on top. We got to the weigh in and got to visit with a lot of the competitors. We also got some sweet baits and a DVD from kayak fishing pro Jeff Little and his company Confidence Baits. When it was all said and done, my total was good enough for 3rd on the day. Tim Perkins of Alabama took home first place with a total of 49.25". His brother Greg was second and Bill finished in 4th. As a team, the Perkins brothers also took 1st, Bill and I took 2nd, and the local duo of Metheny and Davis were 3rd. Tim also happened to be in 1st place in the AOY competition coming into the event so his top finish secured his win as RiverBasser of the Year. I got to talk to Tim quite a bit in Roanoke and came away very impressed - he was a very deserving winner. He is a great competitor, angler, and individual. In fact, we both have a focus on promoting the sport we love and getting kids involved, which was great to talk about. I hope to get on the water with Tim sometime in the fairly near future. My finish helped me secure the runner-up position in the AOY competition, ahead of a group of incredibly talented anglers. I was really happy to come away with that finish in one of the top kayak fishing tournament trails in the country. But, even more excitement was on the way - our team finish helped us secure 1st place as the RiverBassin Team of the Year. Our main goal was to win team of the year and we did it - never finishing lower than 2nd place. Bill and I have become great friends this year and I can't thank him enough for joining me on the water. 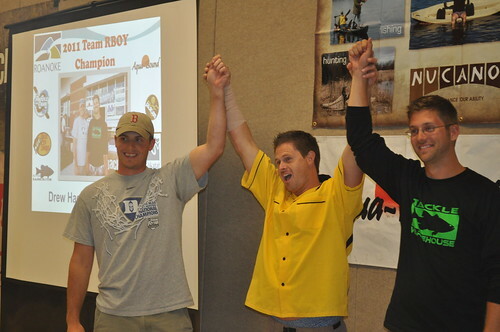 Check out the RiverBassin Recap here and final AOY & TOY standings here. There should also be an article out soon in Kayak Fishing Magazine. 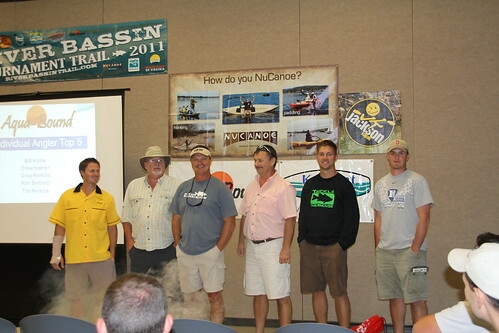 Ladies and Gentlemen - your RiverBassin Trail Team of the Year! Overall, the trail had 12 tournaments in 10 states. It brought in 183 anglers from 21 different states, 68 teams, and over 6000 inches of caught and released river bass. Not only was this group of anglers extremely talented on the water, the RiverBassin community is hands down the nicest group of guys and gals I have ever met. If you love to bass fish on rivers, streams, creeks, and other flowing bodies of water, check out RiverBassin.com and I guarantee you will love it! This tournament will almost wrap up my tournament calendar for the year. I was able to meet a lot of my goals this year and over the past two years I have shown I can compete with anyone in rivers and lakes across the country. However, this year also got me thinking about why I love to fish and it is making me consider an early retirement from tournament angling. However, I don't want to pull an MJ and try to go out on top only to come back time and time again. But, next year I think I have another goal that only 1 person (to the best of my knowledge) has been able to complete from a kayak. I am going to keep you in the dark on that one. Before I forget, a huge thanks to Mary May, Bill, Brett Hinson, Drew Gregory, the RiverBassin Trail crew, my parents, and everyone else who helped make everything possible for me this year. I couldn't ask for a better girlfriend, who has supported me through some serious ups and downs this year. When it seemed like the walls were caving in on my dreams you helped motivate me and rise above it - I love you so much! Bill you already know how much I appreciate you joining me this year. Getting on the water with you is always fun and I think we learn a lot from each other - definitely a life long friendship. Brett, you make some incredible rods and it is an honor to be on the Carolina Custom Rods pro-staff. Again - thanks to everyone! So, I did mention "almost" wraps up my tournament season. I have two events left - one of which I am fishing and one of which I am hosting. On October 1st I am returning the favor to Bill and joining him for the Southern Open Championship Trail event on High Rock Lake....yes, this is an event I will be fishing from a bass boat. However, I think I am going to where my Jackson Kayak shirt to the weigh-in! Actually, I am really looking forward to it as it should be a fun day and good test, since a number of BASS Elite Series Pros, FLW Pros, BFL Pros, and others will be competing. The second event is the Froggy Waters Outdoors Freshwater Slam to be held October 15th in Bahama, NC. This event is aimed at getting youth involved in the outdoors and also providing a friendly competition. Proceeds benefit the Schoolhouse of Wonder - an awesome non-profit who does wonders for getting youth involved outdoors. The grand prize is a Jackson Coosa Elite kayak and the prize list is unbelievable for this event (check it out at www.froggywaters.com). It also includes guided kayak fishing trips with some of the top guides for musky, stripers, and trophy bass! Best of all, Get:Outdoors is allowing us to provide free kayak or canoe rentals to anyone who needs one! 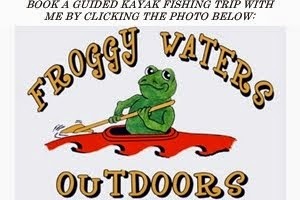 If you have any questions, feel free to email me at drew@froggywatersoutdoors.com. Well, I'll either be chasing giant bass or working on my dance moves. In the mean time, it is time to try and put a few more 5+ lb fish in the yak...and in Mary May's yak too. I also have a couple more exciting things happening in the near future, which I will unveil shortly. Until then...tight lines! After a good night of sleep, I awoke with one thing on my mind - big bass. Granted, that is how I wake up pretty much every day, but I knew just the spot I wanted to try for big, summertime, river bass. I switched out some of my smallmouth gear from the rodeo for largemouth baits and off I went. I made a fairly long paddle before getting to the area I wanted to start in. It didn't take long before I hooked up with a few 1-2 lb largemouths. Then I spied a gorgeous stump completely underwater while standing in the Coosa. I threw my Deep Creek Lures Razor Beetle toward the stump and let it sink. As I picked up, I felt the weight of a fish and set the hook. The fish immediately went airborne then back down into the stump. While doing so, he lodged the hook onto part of the stump and managed to come free. It was not the way I wanted to start the day - as he was easily over 4 lbs. I continued to another stretch where I caught two 2-3 lb bass that followed my swimbait, but didn't quite commit, by throwing a flutter worm out as a follow up bait. I will admit, it wasn't ideal swimbait water, but I had to try it since I suspected some real giants lurked in there. At this point I wanted to return to the stump and try it again - it just looked too good. I threw my Razor Beetle in again and immediately felt a bite. I set the hook and it was game on....but not 5 seconds later the fish had done the same thing as the first - wedged the hook into the stump. I was beginning to think it wasn't my day as it was another 3+ lb bass. A little discouraged I headed down river, landing a couple smaller bass on crankbaits. I saw a downed tree that looked perfect, threw my bait out, and...nothing. I reeled it in and somewhat haphazardly flipped my bait toward a nearby bush. All of a sudden, I felt a bite and set the hook on what felt like a really good fish. He ran for some downed wood cover and I did all I could to keep him out of it. Finally, I was able to fight him with one hand and paddle with the other until I got out into the middle of the river. The fish did not want to give up and was pulling furiously. In one last ditch effort, he managed to wrap the line around a small stick that I couldn't see on the bottom of the river. I reeled him, and the stick, to the boat and lipped him. He was a brute and I knew it was one of my biggest river bass of the summer. I got to the bank and got a few pictures. Then I put him on the measuring board and scales. The fish was extremely thick and 22" long. He weighed in at 6 lbs on the dot. It was exactly why you never give up when on the water. The picture really didn't do this fish justice, but I felt bad holding him with only one hand. Sometimes pigs like this show up when you least expect it! I landed one more small bass before switching to a buzzbait shortly before dark. I landed 3 or 4 more bass fishing over downed trees with the R&S Baits Chatterbuzz rigged on one of my Carolina Custom Rods. It was a great day for me! But, Mary May was less enthusiastic about her day. 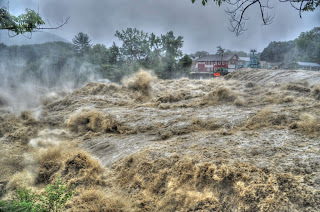 Her hometown and much of the northeast was getting blasted by Irene. The rains caused flooding like never before. Brooks became raging flows and rivers wreaked havoc on roads, bridges, and buildings. Thankfully, she and her family remained safe and Mary May was able to make it back to NC just in time for her nursing exam...which she aced. This trip was the last local trip I have made. However, last weekend Mary May and I met up with Bill Kohls and his girlfriend Misty near Roanoke, VA to fish the final leg of the 2011 RiverBassin Tournament Trail. Hopefully I get that blogged soon! Until then...tight lines! Where do I start this one? I guess the beginning makes logical sense...right? About 2 years ago, more or less, I stumbled upon RiverBassin.com. I grew up as a bit of a river rat, stream stalker, creek crawler or whatever you want to call it. So, I was delighted to find the sight and the group of guys behind it. I can say that the members there are some of the nicest guys I have ever met and incredibly talented fishermen to boot. A few months ago my friend Mike, aka Catawba, sent me a message about helping to organize a RiverBassin Rodeo. What is a RiverBassin Rodeo you might ask. 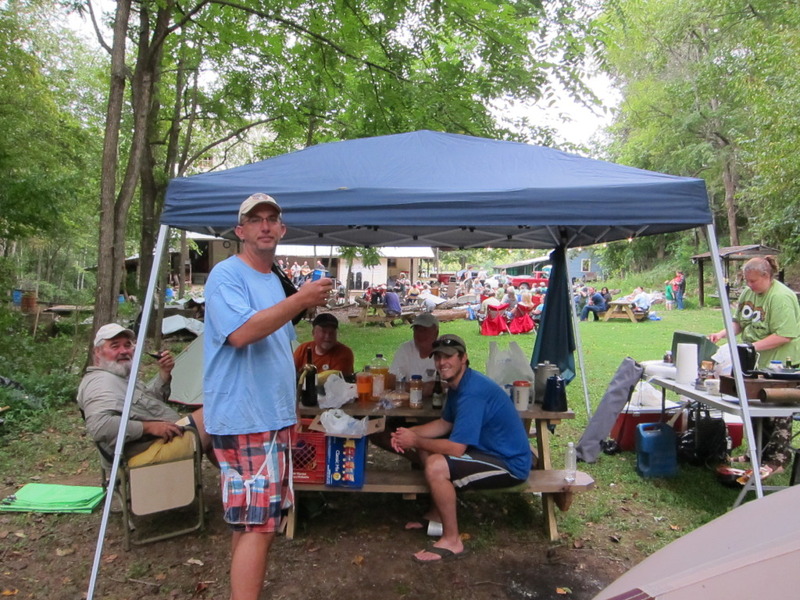 Well, a RiverBassin Rodeo is a tradition of the site and is basically a big meet 'n greet that occurs in each state. However, anglers come from all over the place to enjoy the commraderie and fish new waters. Last year, North Carolina didn't have a rodeo, so we were set on making it happen this year. After a bit of discussion we roped a friend of ours, Mookie, into the planning and decided to have the event on the Dan River in north-central NC. We set the date for August 27th and patiently waited all summer as the event started to draw more and more interested. As noted in the previous blog, I had been in Wyoming and was just getting back in to town two days before the event. Unfortunately, I wasn't the only one headed toward NC. Hurricane Irene was blowing up the east coast and wreaking havoc along the way. However, nothing would stop this rodeo from happening and we didn't cancel the event. Thankfully, the weather was forecasted to stay close to the coast and it did just that. Ready to hit the water! A few folks had been out there for a multiple days, but I was only able to make a day trip on Saturday. I awoke and hit the road, nervous, as I headed northwest from Hillsborough. But thankfully, the weather that made me nervous never came. There was some wind and afternoon rain, but nothing hurricanesque. The float was gorgeous and filled with fish. The Dan is a small river, but it packed a punch. My first fish of the day was a chunky little largemouth, which I quickly followed with 3 smallies. I had them patterned and would pound the fish the rest of the day - catching 25+ smallies and a couple of bream. Most of my fish were over 12" with a few over 15". For me, the secret was setting up on current seams or deep pockets with current and drifting weightless plastics. A few times I caught 4+ fish from the same spot and the bigger fish were committing to this pattern more than search baits. The day went fast and was a bunch of fun. I got to meet some great people, listen to some good music, and eat some tasty food. A huge thanks to all the guys from RiverBassin who came out and made it all possible. As I headed home Saturday I realized that my Sunday was actually fairly free, so I started strategizing on where to chase big largemouth. Further north, Mary May was bracing for the wrath of Irene and wishing she was fishing. 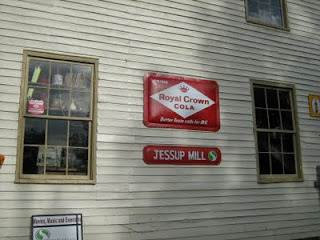 Thankfully, post Irene conditions were good for me....but not as good for western Massachusetts. Sorry for the delay, but things have been CRAZY the past week. So, let me get back to Wyoming. It was our second to last full day in Wyoming and our last day with a fishing license. Some neighbors had mentioned a few places we should check out, so we scoured the map looking at distances, slopes, terrain, and of course fishing locales. We finally settled on an excursion to Seven Brothers Lakes. Seven Brothers was located in a wilderness area and looked to be a nice day hike. So, after a relaxing dinner and some rest, we were on our way. As you can imagine, the roads to wilderness areas can often be a little crazy. I have been to some places with paved road right up until the end and other places where a 4x4 was a must. This road was the latter. We climbed over small boulders as the truck shook like an overloaded washing machine. As we reached Solider Park, a few miles from where we wanted to start, the road divided. Of course, the roads were poorly marked, but somehow (probably because Betty is a former orienteering national champ) we made it down the right one. We threw dust to the wind as we rolled across the plains, with glimpses of streams and snow capped peaks in either direction. Finally we came to the trailhead - aka where the truck could go no further without needing new shocks, a re-alignment, and a host of other things. Mary May and I packed up our lunches, some water, and the fly fishing gear and were on our way. Mind you, we were carrying the supplies in my over the shoulder computer bag rather than a backpack, which we didn't have. As I mentioned, the road sucked. And it sucked for hiking too. Small boulders covered the road and made the walking tough. Of course, we wanted to pack light for our trip (see lack of backpack), so we were in sneakers rather than hiking boots....a mistake we won't make again. Even so, we made it through the first few miles pretty easily - spotting a gorgeous juvenile golden eagle (still massive in size) along the way. We also encountered a mule train, who had been on the trail for over 30 days and had started in the Rockies....better them than me. I think I would rather hike than ride a mule that far, but I digress. Soon after the mule packers, we dropped into a meadow and found another interesting part of the hike - a stream crossing. We were warned of said stream crossing, but we hadn't thought much of it. The stream was about 20 feet across and only about 8-12 inches deep. We decided to take off our shoes and wade it. After being in the water for about 20 seconds my legs to started to shiver and my feet were numb. I made it about 1/3 of the way before realizing I had no chance of making it without falling. The cold was simply debilitating, especially when combined with slippery rocks. So, we decided to retreat, put our shoes back on, and eat lunch. After getting re-energized and psyching ourselves up, we forded the river with shoes...and made it quite easily. Laughing at our silly thoughts of going barefoot, we meandered through the low forest before beginning our descent to 9800+ ft. This was the part of the trail that amazed us both in hindsight. Somehow, we blazed up the incline, making short work of what was estimated to be a 45 minute romp by the local paper. And as we crested the mountain top we could see glimpses of sun reflecting off of water....we had made it! We were met with a stiff, albeit cooling breeze. It echoed across the mountain top, which was covered with boulder deposits. We took a quick look at the near side of the lake before boulder hopping to the other side, which was a little more protected from the wind. Mary May started with her now infamous bumble bee pattern and I with a dragon fly. Within minutes I spotted a couple of fish and had one bolt toward my fly - only to have him turn at the last second. Apparently, the fly just didn't look right. So, I went to plan B - a stimulator. I spotted some more fish, but of course, they spotted me too and could have cared less about my fly. I am fairly sure I spotted rainbow, brown, and lake trout all in the same general area. Finally, I saw a fish feeding about 60-70 feet from shore. I double hauled the heck out of my line to get it to the spot in the windy conditions. No sooner did the fly land and it was FISH ON! My 3-4 weight rod was doubled and line running hard right. The fish went aerial multiple times and pulled some drag. He wasn't my biggest fish ever, but he was one of the prettiest rainbow trout I have ever seen - 14" of pure beauty done no justice by our pictures. A big thanks to Mary May, who had run over to see the fish only to have to run back to get the camera from our bag and come back again to get a few pictures. We released the fish and started plan C. Plan C was to use nymphs tied about 3 feet below our dry flies, since the fish weren't feeding very actively on top. As we made our way toward the gear I looked down the bank and saw something brown in the water. Initially, I thought it was a juvenile moose, but quickly realized it was at the other end of the food chain. "Holy $%#+" I exclaimed. Mary May thought I had just seen a giant fish as I was looking, in general, toward the water - as I tend to do wherever we go. I pointed as the bear stood up to exit the water. He was only 60-70 yards away and only about 30 yards (if that) from our bag. He dried off with a quick shake and bounded across the boulder field in no time flat. We saw him disappear into the woods as we walked over to our gear. I laughed, wondering where he had come from, how long he had been there, and what if we had been at our bag instead of a distance away. Of course, it felt great to laugh because we had been holding our breath moments earlier - wondering if the small bear had a mother nearby (even though it wasn't really the season for mommas and cubs to be together). Now smiling ear to ear, I could have left happy right then and there. But of course, I rarely turn away from a fishing opportunity and really wanted Mary May to hook-up. So, off we went with our new dry-dropper rigs and started casting. It didn't take too long before Mary May had a violent strike. She did everything perfectly, but the fish managed to break the dropper line and get away. We were pretty bummed, but she admitted to being excited to see the strike - her first on non-flowing water. We also hiked to the second lake, but it was even bigger and windier. We decided to give it a quick go and both managed a small strike. However, we were getting tired and it was getting late, so we decided to head back to the first lake. We only fished another 15 minutes, before giving in to exhaustion and getting ready to head down the mountain. The high altitude, sun, and lack of serious sleep had made a mark over the course of our trip. We talked about how much we enjoyed the hike, our first serious hike together, as we descended. The only thing that could have made it better was getting to see a big bull elk or moose...our fingers were crossed! Mary May approves of this adventure! After what seemed like twice as long as the trip up, we made it to the stream crossing, this time trudging across like it was barely even there. We winded our way through the forest and up the hillside before coming to the final 2 miles of trail, which marked the way to the truck. Unfortunately, our feet were killing us at this point due to the lack of hard soled shoes. On top of that, Mary May's back was hurting and my shoulders were paying the price of taking a one shoulder bag for what was certainly a two shoulder day hike. Finally, we saw the light penetrate the edge of the forest, giving way to the meadow where the truck parked - filled with ice cold drinks. It was pure bliss after our 8 mile jaunt. Betty and Martin were nearby reading and filled us in on their day. They did some fishing in the stream, took a nap, saw a big cow moose, and just generally enjoyed the day. We told them about our adventures as we again traversed the boulder patch road back to civilization. As we came to the top of a small hill, we all went silent. Ahead was a bull moose, looking lost in the middle of the road. He slowly came toward the car, allowing for some photos and Bullwinkle jokes, before he hung a hard right into some thick coniferous brush. Our trip to Wyoming was now complete! We battled sleep on the way back to the cabin where we chowed down on dinner, made a fire, and drifted to sleep to the sound of the creek. The next day we headed to Gilette to spend a day with my sister's family. It was great to just relax and hang out with them - particularly getting to play with my nephews. The next day I was headed back to PA then to NC. Mary May was headed to Massachusetts for a few days before returning to NC when school started. For me, it meant I had a day and a half to catch up on work and errands before the NC RiverBassin Rodeo. Of course, this was all happening as hurricane Irene crept up the eastern seaboard. 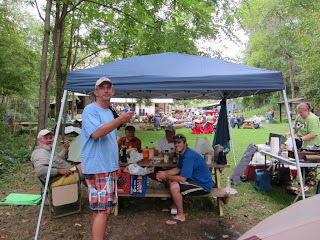 So, my next blog will be about the NC RiverBassin Rodeo and our flirtations with Irene. Until then, tight lines!